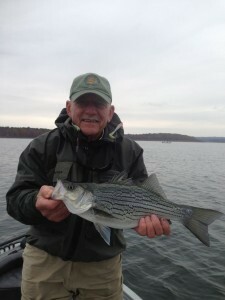 On Friday Bo and his old buddy, Paul Broddick, headed to Greers Ferry Lake to hunt Hybrids. The weather was perfect: cloudy, rainy, cool with rolling fog and the Hybrids were happy! Not a quarter of a mile from the ramp we ran into Hybrids crashing Threadfin Shad over at least an acre of water. The water was literally boiling with hungry Hybrids gorging on shad. 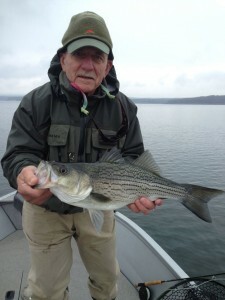 In nothing flat fly rods were bent tight on big fat Hybrids. We did not find the really big Hybrids but these fish averaged five to seven pounds and catching fish right on the surface on eight weight fly rods is just too much fun!! 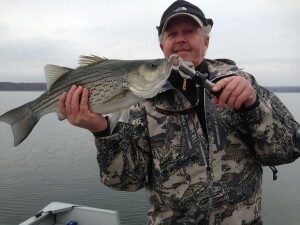 It really is a sight to see these big fish slashing at shad on the surface. All day long we kept finding pods of one to ten fish and if they were within casting range they readily took the fly. Bet we never got more than a mile from the boat ramp. Admittedly this can be a hit, or miss, experience; but if the conditions are right it is simply an amazing sight. If we don’t find the Hybrids all is not lost; we simply pull off the lake and head for the Little Red River and a few Brown Trout to finish off the day. If you would like to go hunt Hybrids with us just book your trip with Empty Creel Fly Fishing Guides and Outfitter.